Horned sea monster? Dragon? A long, smelly carcass that washed up on the Spanish coast may never be conclusively identified — but experts say it sure looks like the remains of a thresher shark. The latest in a string of "sea serpent" stories has sparked an online buzz in the past few days, thanks to the gnarly-looking pictures that surfaced in the Spanish press last week. 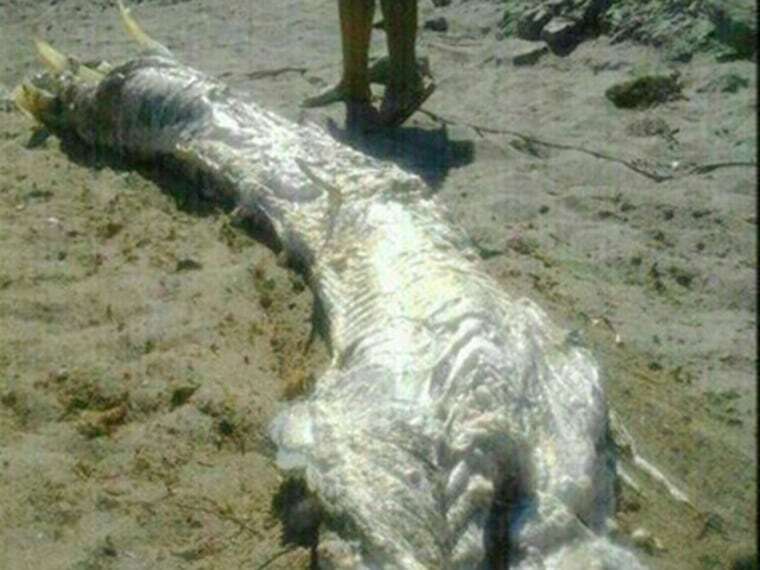 The carcass washed up on Luis Siret Beach in the Andalusian village of Villaricos, according to the local publication Ideal, and sparked jokes about the Loch Ness monster and mutant fish. "A lady found one part, and we helped her retrieve the rest," Civil Protection coordinator Maria Sanchez was quoted as saying. "We have no idea what it was. It really stank, as it was in the advanced stages of decomposition." Sanchez said conservationists with the Program in Defense of Marine Animals, or Promar, were trying to identify the remains. However, Europa Press quoted a coordinator of the group, Francisco Toledano, as saying that any identification would have to be made on the basis of the images — because the decomposing remains were buried by sand. Toledano said the preliminary analysis suggests that the 13-foot-long (4-meter-long) carcass came from a "species of fish," but he wasn't more specific. Almeria24h.com said some experts speculated that the creature could be a thresher shark (also known as fox shark, Alopias vulpinus, or "peje zorro" in Spanish). Such sharks have a distinctive caudal fin that can stretch out as long as the shark's body itself. "It's hard to tell," David Shiffman, a University of Miami shark researcher who blogs about marine biology on Southern Fried Science, told NBC News in a Twitter exchange, "but the official guess that it could be a thresher shark seems plausible." Shiffman said it might also be a giant oarfish (Regalecus glesne) — a ribbony fish that's typically 10 feet (3 meters) long but can grow to lengths in excess of 33 feet (10 meters). Oarfish sightings have been thought to inspire tales of sea serpents, and it's only been recently that the beast has been caught on video in its deep-sea environment. But Florida State University ichthyologist Dean Grubbs settled the matter in a follow-up email. "That is definitely a shark skeleton," Grubbs told NBC News. "The elements toward the back were confusing me, but those are the lower caudal fin supports. The 'horns' are the scapulocoracoids which support the pectoral fins." He had me at "scapulocoracoids." Shiffman agreed that Grubbs had the gravitas to settle the question: "If not the leading shark morphology guy, Dean's certainly [in the] top five," Shiffman said via Twitter. Next up: the strange case of the alien pony mutilation. Sea monster video? That's a jellyfish! This story was first published at 6 p.m. ET Aug. 21, and updated with Grubbs' identification of the remains at 9:25 p.m. ET Aug. 21. Tip o' the log to Gawker and Boing Boing. Alan Boyle is NBCNews.com's science editor. Connect with the Cosmic Log community by "liking" the NBC News Science Facebook page, following @b0yle on Twitter and adding +Alan Boyle to your Google+ presence. To keep up with NBCNews.com's stories about science and space, sign up for the Tech & Science newsletter, delivered to your email in-box every weekday. You can also check out "The Case for Pluto," my book about the controversial dwarf planet and the search for new worlds.